Our HyperCore FB35 high performance heat pump is guaranteed to give you its full 4kW of heat in temperatures as chilly as -15°C. Only HyperCore can offer this. 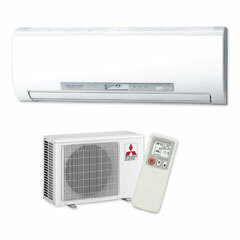 This heat pump is ideal if you are looking to heat a smaller room and you live in frosty or high humidity area. Unlike other heat pump systems which produce less heat when the outside temperature drops, the HyperCore FB35 will perform at ideal capacity down to -15°C. HyperCore is the only heat pump range that can guarantee this kind of performance. HyperCore is ideal for; locations where temperatures fall below zero, high altitude areas, high humidity areas or if you simply want the best heating performance available. Our advanced i-see sensor automatically seeks out temperature differences in the room you need to heat, directing airflow to these areas to bring them up or down to temperature. This prevents excessive heating or cooling and therefore unnecessary operation, ensuring total comfort and reduced energy wastage. Starting from barely a whisper, our Deluxe FB Series allows you to feel the warmth, not hear it. The range starts from a hushed 20dBA. Perfect for asthma and allergy sufferers, these filters have two functions that work together to remove even the tiniest airborne particles and break them down. A self cleaning ozone shower sterilises and deodorises the indoor unit, ensuring that you get clean, fresh air all year round.